Happy Monday friends! 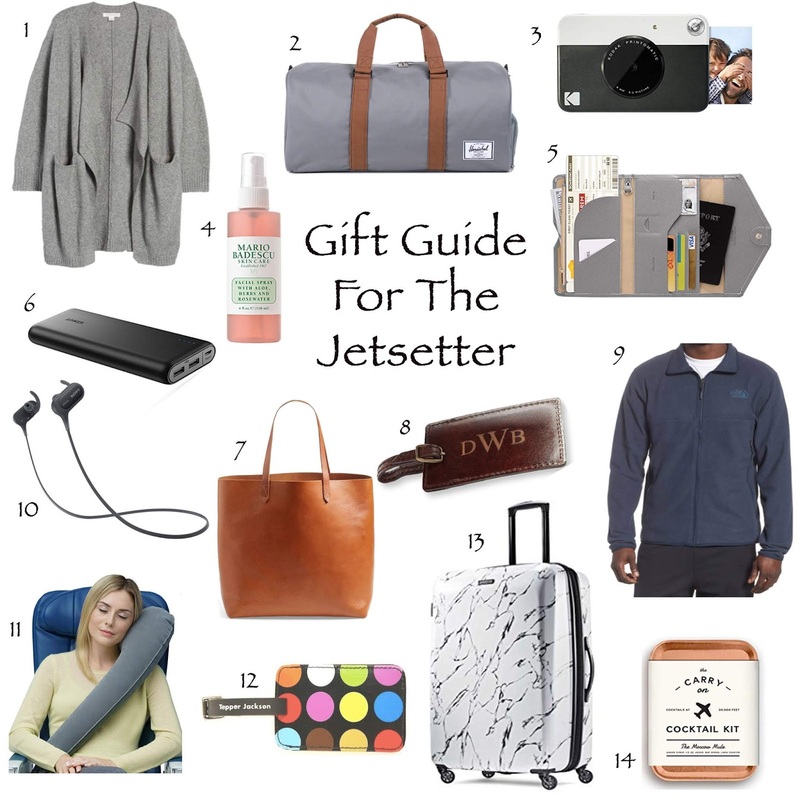 I'm skipping this week's regularly scheduled fashion post to give you a Gift Guide For The Jetsetter. You know that person in your life who either travels a lot for work or the one who has a serious case of wanderlust. K and I have traveled a good amount and we both have our travel must haves. Most of the things on today's list we own and a couple we plan on purchasing before our next trip in January. I hope you enjoy! I travel in layers, usually a tee shirt and this soft cardigan. The pockets on this cardigan are a must for me. K has a version of this bag and takes it with us on every trip. The best detail is the separate compartment for shoes. I love to take photos and love the little photos that these cute cameras print. I think they are perfect for making memory books. I just bought this on Saturday and love it! Whenever I'm feeling a little dry I just spritz myself. I can see this coming in very handy in the dry air of a plane and will packing it my carry on in January. I notice when people travel they are clutching ten things with two hands. This organizer eliminates that and I'm thinking of gifting it to a very organized traveler I know. I CAN NOT go on vacation with out this little guy. A nice carry-on tote that you can throw anything and everything in. I love this color, I have a large black tote and have been coveting one like this. A pretty and inexpensive luggage tag for those who have classic style. Just like the cardigan for women, this North Face jacket for guys is perfect for layering. These are an early Black Friday deal and get great reviews. I've never been able to use a travel pillow because they just aren't comfortable to me. This one intrigues me because it looks like a smaller, inflatable body pillow that can be used in many different positions. A fun luggage tag for the travler with colorful style. I have this and love it! It's so light and easy to get around with. It is so easy to spot in the luggage belt (from our last trip), it was the only piece of marbled luggage. How fun is this! The one I have linked is a Moscow Mule, but there are several other's like an Old Fashion which K used on our last trip.